I’m not really sure if there’s any connection between Cagayan de Oro’s Plaza Divisoria and the Divisoria market area in Manila, but its official name, the Golden Friendship Park, is much more apt since Cagayan de Oro’s nickname is the City of Golden Friendship. Plaza Divisoria is actually just a small narrow strip of land (highlighted by yellow lines in the satellite image thumbnail) in downtown Cagayan de Oro that was built in 1901 as an urban divider or firebreak. (Oh, so “divisoria” actually means divider!) The plaza hosts a bunch of monuments dedicated to various Philippine personalities like José Rizal, Andres Bonifacio, Pres. Ramon Magsaysay, and Mayor Justiniano Borja (whose statue was created by National Artist Napoleon Abueva). Looking at various photos of the Plaza online, it seems to be like Cagayan de Oro’s version of Manila’s Baywalk during Mayor Atienza’s time. 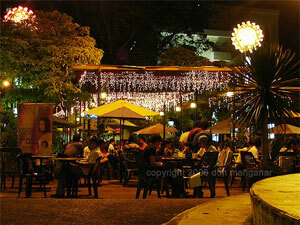 The same type of street lights are installed and the same type of al fresco dining places can be seen. Too bad CDO doesn’t have Manila Bay’s sunsets to match. ah yes! daghang og gwapa pag nite cafe. y dont you feature alegria hills in cdo? labi na ug tga XU!! palahubog jd au.. haha!! nah!! Backyard and any places.. duhh.. no. 1 jd na cla..